The Sevier County tourism industry could use your help if you’re looking for a job. 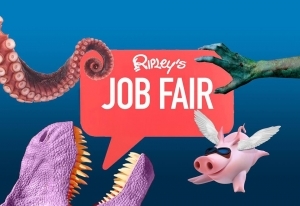 Seven Sevier County attractions are holding job fairs this week including: Ripley’s Attractions, Guinness World Record Adventures. They’re all looking for all types of workers from cooks to aquarium mermaids. Pay is up to $15 an hour. The job fair is Tuesday at the Ripley’s Aquarium of the Smokies in Gatlinburg from 1:00 to 5:00.